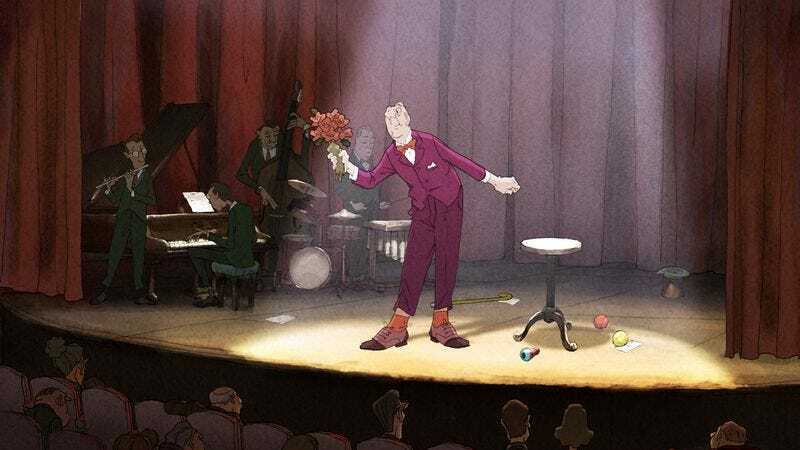 The magician in Sylvain Chomet’s animated adaptation of Jacques Tati’s screenplay The Illusionist is a kindly, bumbling man who looks and acts a lot like Tati’s signature character, M. Hulot. That nod to Tati—which extends to the magician’s name, Tatischeff, which was Tati’s birth name—isn’t just about paying homage to the legendary French filmmaker and comedian. The Illusionist is set in the U.K. in the 1960s, and is partly about how Tati’s style of genteel entertainment fell out of favor. The film is episodic, showing the illusionist Tatischeff dealing with technical snafus, indifferent audiences, and a new breed of performers more suited than he to the faster pace and scientific wonders of the space age. When Tatischeff encounters a wide-eyed fan, he tries to convince her he still has some magic left, and the film tries to do the same, in scenes and images that reference the generation of mid-20th-century filmmakers who explored the medium’s capacity for spellcasting. Chomet (The Triplets Of Belleville) and his team of animators at Django Films tell this story in little setpieces, often built around magic tricks, which don’t always translate well to animation. But Chomet shows some healthy skepticism toward the art of magic in general, and what it really means. The Illusionist is filled with pretenses both grand and petty: a snowstorm that’s really a flurry of feathers, macho rock musicians who are secretly gay, the false promises of billboards and window displays, and so on. The story also ends on a melancholy, ambiguous note, with disenchantment and new hope jumbled together. In the end, Tati and Chomet are saying something complex but true, testifying to the necessity of fakery while acknowledging that illusions can be cruel. Availability: The Illusionist is available in a DVD/Blu-ray combo pack from Sony Pictures Classics, and available for download from multiple retailers.